Gardner Pilot Academy sixth-grader Michelle Mota reads her story in the recording booth at the PRX Podcast Garage in Allston, where her class put together memoirs. Most youngsters don’t even think about their life stories, let alone take the time to write and share them. But for sixth-graders at Gardner Pilot Academy (GPA) in Allston, an opportunity to tell those stories not only changed their lives, but taught them how to produce podcasts that can be heard by peers, families, and the community. Randyl Wilkerson’s sixth-grade reading and writing class has focused on a personal narratives unit for the past several weeks. For a final assignment, Wilkerson decided to try something different. 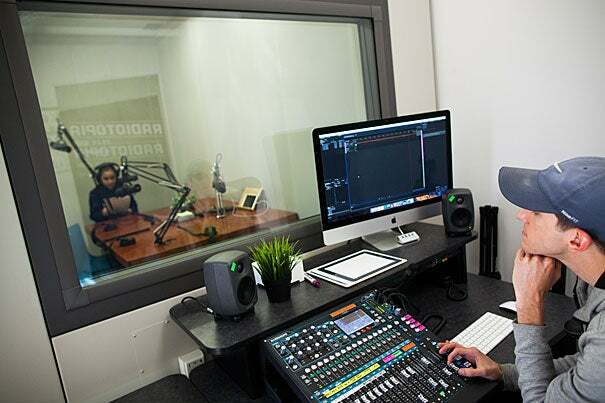 After attending an event near the digital media organization PRX’s Podcast Garage on Western Ave. in Allston, she wondered if her students could access the community recording studio that had opened in August. The Podcast Garage was created as a public space and educational hub dedicated to audio storytelling, so it seemed like a natural fit. 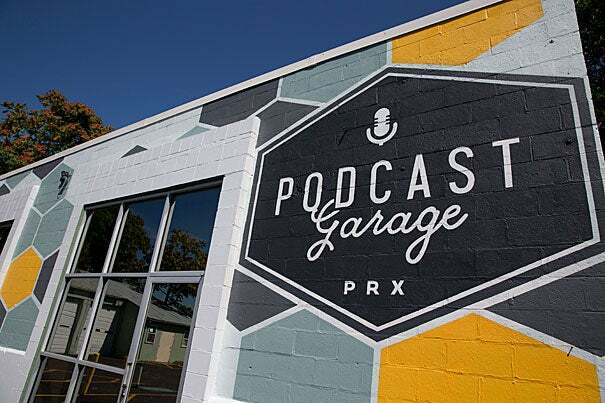 The Podcast Garage partners with Harvard University as part of its Zone 3 initiative to explore creative programs, events, and retail along Western Avenue. Audrey Mardavich, PRX director of special projects and project manager for the Podcast Garage, was quickly taken with Wilkerson’s proposal. The sixth-graders began with a field trip to the Garage in October to learn about podcasting, see the equipment, and try their hand at recording. But before embarking on writing their personal narratives, the children heard from Cambridge storyteller Don Picard, a regular with “The Moth,” at which people tell true stories onstage before a live audience. By choosing an important event in their life, the students learned the structure of writing. With no assigned story length, they were able to use a free-form style to develop their thinking skills. “This is an incredible opportunity for the kids to express themselves, to learn, grow, and practice, and gain really valuable skills they can use later in life,” said Vanak Huot of Brighton, whose daughter, Amara Garbarino, wrote about a birthday celebration with her best friend. The narratives, according to Wilkerson, span the gamut from family events, siblings, shooting baskets on a summer day, and jumping on a trampoline, to bullying and forgiveness. The Podcast Garage shares Harvard’s mission to engage the Allston-Brighton neighborhood with ongoing cultural and academic work that explores ideas, programs, and opportunities. Mardavich said being part of the Zone 3 community does indeed provide the community with interesting programs, training, talks, and unique experiences, but their larger commitment is to supporting and strengthening the local vibe, especially for the younger members of the community. “We’re incredibly excited about the meetings between PRX and the GPA. This is exactly the type of interaction we hoped for when envisioning Zone 3 — engaging partnerships between the community and the many diverse organizations and initiatives up and down Western Avenue,” said Kevin Casey, associate vice president of Harvard Public Affairs and Communications. The GPA sixth concluded its unit with a publishing party for the students and their families at the Podcast Garage. More than 45 people attended and students read their personal narratives out loud to the live audience and shared their podcasts. Although this was the first time Wilkerson used audio as a teaching tool with her students, she said it was such a huge success she would like it to become part of the regular curriculum. Gardner Pilot Academy plans to play a different student’s podcast each day during morning announcements, and she hopes that will become a tradition. Thirteen-year-old Dorlie Registre of Allston said she loved sharing her story so everyone who hears it can know that even though forgiveness is hard, it can change someone’s life. Her mother, Jealline Registre, agreed. Will Macarthur '20, a member of Club Four at Cambridge Rindge and Latin School before coming to Harvard, decided to apply to the College in part because he enjoyed volunteering at the Harvard Square Homeless Shelter.